On Friday August 7th Nicolas Roche was in Dublin to celebrate the launch of the Magnet Female and Male Junior Cyclist of the Year awards. NRPT-Magnet.ie cyclist Patrick Goszczyk, Magnet CEO Mark Kellett, Nicolas Roche and NRPT-Magnet.ie cyclist Jenny Neenan launching the Magnet Junior Cyclist of the Year Awards. Visit our Facebook page for more photos from the launch. 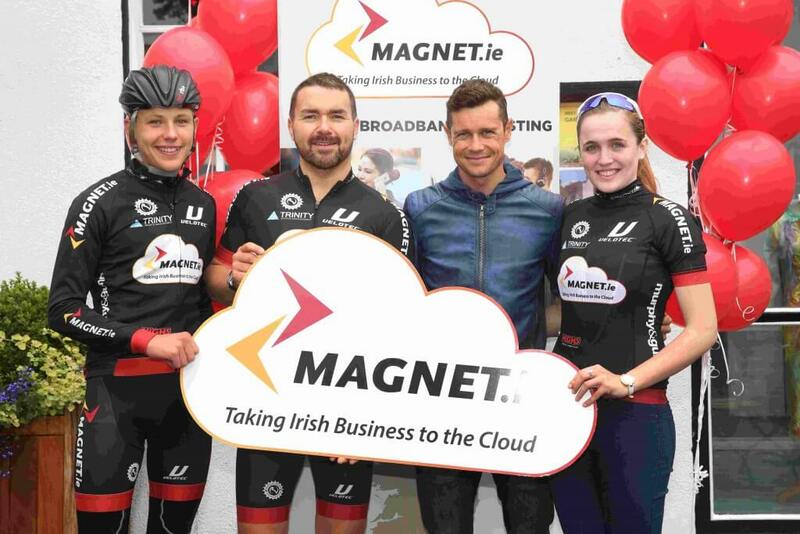 Magnet are proud to be strengthening its ties to Irish cycling and recognising the outstanding ability of the young Irish talent who will no doubt continue to hone their skills and do Ireland proud on the international stage. “We would all like to see the increased popularity of cycling in Ireland feed through to the competitive ranks of the sport,” he continued. Since turning professional in 2014, Nicolas has continued to carry the torch for Irish cycling, having twice been national champion and with numerous top ten finishes in the Grand Tour stages, including a stage win at the 2013 Vuelta a Espana. He also represented Ireland at the 2008 Olympics and has competed for Ireland 7 times at the road world championships. In the Nicolas Roche Performance Team, Nicolas has recognised the important of developing young Irish riders and helping them make the transition from junior status to u23 and on to professional ranks. Competitive cycling has come a long way in Ireland however it wasn’t until the 1960s that Ireland made it’s mark on the international scene with the great Shay Elliot achieving multiple wins on the continent. Elliot paved the way for two Irish legends in international cycling: Sean Kelly, who won Paris – Nice seven years in a row, and of course Stephen Roche, father of Nicolas Roche, who in 1987 became the 2nd of only two cyclists to win the Triple Crown of the Tour de France, Giro d’Italia and the World Road Race Championship. It isn’t just competitive cycling that has taken the country by storm. CSO statistics indicate a 10% increase in commuters opting to cycle to school or work in recent years. In Dublin there is a far larger increase in the percentage of those ditching the car and biking to work – an impressive 26% over the same period. Moreover, these figures only include those who cycle as their main mode of transport, meaning that people who only cycle twice a week or use different transport for a longer part of their journey are excluded, meaning the numbers could be even higher. Key factors in this increase are thought to be perceived safety, cycle infrastructure and traffic congestion, aided by the cycle to work scheme which was introduced to encourage employees to cycle to work. Of course, the health benefits of a daily cycle and savings on transport costs are also huge incentives. Since its introduction in 2009 the year-on-year growth on annual subscribers to Dublinbikes has meant it has outperformed all its European counterparts. Dublin was an ideal location for the largest gathering of urban cycling advocated in the northern hemisphere – the European Cycling Federation which was held in the city last year. Over seventy cycling campaigners from twenty different countries attended, representing 50 million utility cyclists across Europe – putting Ireland at the heart of Europe’s thriving cycling community: long may it last!